This weekend I was at the mall with my whole family doing a little Christmas shopping when what to my wondering eyes should appear, but a mall Santa before Thanksgiving. Now, I love Christmas more than the average person. In fact, I love it so passionately that I have to force myself to wait until after Thanksgiving to watch Elf and begin listening to Christmas music. So I think the mall people, or the village people, or whoever is in charge should put the Santa thing on hold until the turkey dinner is at least cooling in the fridge. The pilgrims and the indians are seriously getting the brush-off from the advertising industry and this needs to stop. That being said, if you know me and my family, you know that we like to take pictures of ourselves doing silly things in public places. 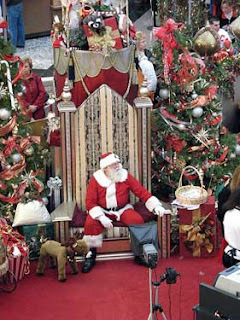 Yesterday the mall Santa was on break and obviously doing a little shopping for the Mrs. at the jewelry store near the center of the mall. My oldest son was encouraging my middle son to go over to Santa and lean over the jewelry counter beside him so he could get a picture. Well, let's just say that timing is not the forte of my middle son so he hurried over and old Santa noticed what he was up to before my budding photographer son could get the picture. David, thinking fast on his feet, blurts out (in his very deep for thirteen voice) "I love you, Santa!" Mr. Mall Santa looks right into the eyes of my son and says, "Well I don't love you! Now get away from me!" Ahh, can't you just feel the Christmas spirit in the air....love, joy, peace and all of that? Yeah, me neither. But we all got a big laugh and I can always use one of those. So, dear friends, the Christmas season is apparently upon us and all I can say is, "Yes, Virginia, there is a Santa Claus...and he is a big, fat old grouch!!" That's the best story I ever heard. I just read it to the Drew's because I thought it was sooooooooooo funny. I can only imagine the adventure of having teenage sons. that is funny...i too relate to the Christmas music listening, etc and I think it is getting out of control...christmas music right after halloween? ?